Behind the wheel, ahead of the curve. We are an authorized E-Z-GO Parts and Service center. 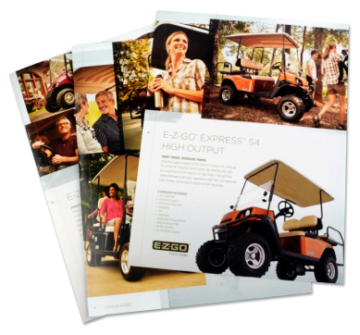 We have access to any part E-Z-GO makes. We also stock parts and accessories for other makes of golf carts. Furthermore, we work with a variety of aftermarket parts and accessories providers. We have light kits and rear seats for most golf carts in stock and ready to go. We also stock a large selection of custom wheels and tires. We may well have exactly what you're looking for. Come in and pick up an accessories brochure, or give us a call at (574) 297-5637.